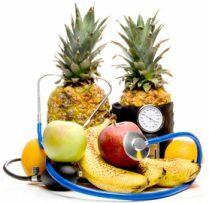 Foods that lower blood pressure - lowering your blood pressure through eating a heart healthy diet is one of the simplest, yet affordable health supplements. A list of eight specific foods to enjoy for more ideal blood pressure numbers. High blood pressure, also referred to as hypertension, can be a serious problem. The definition of hypertension is when your heart pumps blood at a higher than ideal pressure. This is serious since it causes your heart to work harder than it was designed. Although high blood pressure is a concern, there are many natural remedies for hypertension. Some of these are eating healthy foods, drinking clean water, using vitamin supplements, taking good care of your heart by eating low cholesterol foods and even seeking the advice of an alternative health practitioner for natural hypertension treatment. However, the old trite but true adage, “You are what you eat,” holds true for lowering blood pressure. A diet high in those foods that lower blood pressure will have you seeing some positive results. There are many reasons for high blood pressure. Some of the causes of high blood pressure can be avoided, other risk factors cannot. 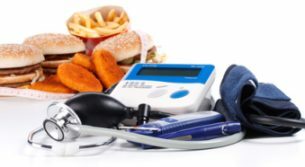 However, as individuals, we each have the choice to either consistently eat the foods that lower blood pressure while giving up those foods that are unhealthy— or not. Eating right is only one, but may be the most important, of the natural ways to lower blood pressure. Celery – This humble vegetable is probably the most effective food you can eat to lower high blood pressure. Celery is a natural diuretic and it also contains an oil that actually relaxes the muscles that regulate blood pressure and generally improves blood flow throughout the body. Enjoy about four raw stalks daily or drink it in juice form. Bananas - Bananas are rich in potassium. Potassium is a valuable mineral supplement that helps to regulate blood pressure by encouraging your body to flush out excess sodium. As your potassium levels increase, you body gets rid of sodium. When you lack potassium, your body retains sodium. If you enjoy bananas, eat as many as five daily. I heard of a study which showed that eating five bananas daily reduced high blood pressure as efficiently as prescription medicine. Potatoes– Either white or sweet, both are rich in potassium. Boil or bake them and eat the skins for the most nutrition. Your body cannot store potassium, so you need to eat potassium-rich foods daily. Beans– All types of legumes are high in fiber, which is a key element of achieving and maintaining an ideal blood pressure. Beans are also high in magnesium— another important mineral for healthy blood pressure. Some varies of beans such as white beans, soybeans, lentils and split peas are high in potassium. Brazil Nuts– Brazil nuts are very high in magnesium and one of the specific foods that lower high blood pressure. Another delicious source of magnesium is pumpkin seeds. Also try hemp seeds for a whole body enriching treat. Just make sure that your seeds and nuts are the unsalted variety! Spinach– Spinach and all other leafy greens are low in calories and high in potassium and magnesium. Dark Chocolate – Along with this being a wonderful antioxidant,enjoying ½ ounce daily will help to both lower and maintain healthier blood pressure without weight gain. Garlic– According to PubMed a pilot study seems to show that that the active part of garlic called allicin may effectively lower blood pressure. Generally, any food high in potassium and/or magnesium and fiber is good for you, but specifically, to maintain an ideal blood pressure. Another of the natural ways to lower blood pressure is to use spices or herbs to lower blood pressure: Saffron, fennel basil, and tarragon to name a few. 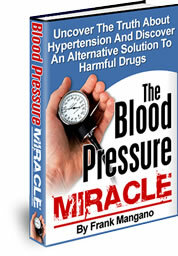 If you're looking for a full natural system for reducing blood pressure I recommend The Blood Pressure Miracle by Frank Mangano. Using this system you can lower your blood pressure with just a little bit of effort and NO drugs! If you've been told that you'll have to take blood pressure medication forever, or are tired of suffering from side effects, The Blood Pressure Miracle could be the right solution for you. It's a 60 day plan with easy changes you can make to take control of your blood pressure! Control your blood pressure WITHOUT spending any money on heart medication! Be free of the side effects of heart drugs such as fatigue, dizziness, muscle cramps, insomnia, impotency, ulcers, drowsiness, constipation, fluid retention, heart burn and many more life-altering side effects! Not have to take several pills everyday! Wake up feeling revitalized and refreshed instead of worn out! Decrease your headaches, dizziness, and bleeding noses! Reduce your risk of stroke and heart attack by getting your blood pressure under control! If you're wanting all of these benefits with a money-back guarantee - check out The Blood Pressure Miracle by Frank Mangano. This link will also provide you with FREE access to Frank's newsletter which gives you access to an in-depth interview with a leading blood pressure expert - Free Newsletter. If you only add the foods that lower blood pressure but forget to remove those foods that cause problems, you're making very little progress to achieve an ideal blood pressure. Just as important to eat the foods that lower blood pressure it is also very important to eliminate those foods to avoid high blood pressure. Here is a partial list of foods to remove from your lifestyle if you are serious about lowering your blood pressure. As you have probably concluded, most of the above foods are laden with salt. Salt is almost always restricted when attempting to lower blood pressure. The “odd one” on the list is everyone’s favorite— sugar. Common table sugar raises blood pressure. If you're serious about using diet as one of the natural ways to lower blood pressure, eliminate both salty and sugary foods from your diet. The knowledge about certain foods that lower blood pressure gave rise to an healthy eating plan commonly known as the DASH Diet. DASH is an acronym that stands for Dietary Approaches to Stop Hypertension. The DASH Diet is a proven way to lower high blood pressure. Participants using the DASH Diet were able to significantly reduce their systolic blood pressure reading according to a study reported in the New England Journal of Medicine January 2001. Eating right is just one of the natural ways to lower blood pressure,but it may be the single most important. Eating the foods that lower blood pressure promotes not only ideal blood pressure numbers, but has many other healthful benefits.